This application is a useful and simple shopping list for your phone. Do you often make shopping lists? If you do, this app made exactly for you! 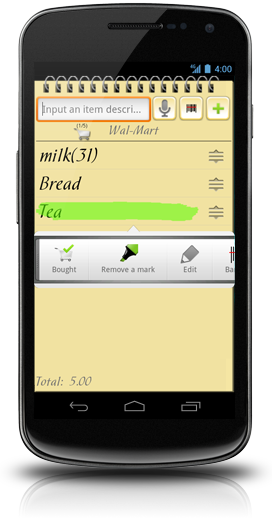 This is useful and simple way of making out a shopping list on your phone. Also, you can mark out important purchases in the list. You just have to tap an item to mark it as "bought". Shopping list can be sent to another phone. We hope that this app will expand your phone and make your shopping easier.